What do you think about Science and Darwinian Evolution? I am being asked this because the person thinks that “Evolution” beliefs and “Christianity” beliefs based on God’s divinely revealed Word contradict one another. I like to clarify that I believe the question is not asking simply about “evolution,” change over a period time, which I believe is evident in nature, but the question is asking what I think about the “Darwinian Model of Evolution,” which is quite different. What about Science and Darwinian Evolution? I know that the scientific enterprise has greatly blessed us with knowledge that has improved our lives in so many aspects that to enumerate all the ways science has benefited mankind to date would be a life-long endeavor. I know that the Darwinian model of Evolution is often presented as possessing a plethora of irrefutable proof, and since the existence of God doesn’t gel with the naturalistic worldview that accompanies Darwin’s theory it appears as if Christians are living on blind faith, ignoring the evidence, and derailing the advancement of scientific discovery! Option 1 – Science and Christianity are not at Odds Answer – In the Jack Black movie, Nacho Libre, there is a scene where his wrestling monk character wants to pray with his partner before a tag-team match and his partner refuses, on the grounds that he “believes in science.” I think this is a common sentiment that if a person believes in God, he or she must then discard Science, and vice versa, that if a person embraces Science, subsequently he or she must reject God. This simply is not the case! The process of experimentation that is the hallmark of Science sprang to life, took root, and flourished within the Christian cradle of Europe in the Seventeenth century. Early founding fathers of Science such as Johannes Kepler, Galileo Galilei, Blaise Pascal, and Isaac Newton were Christians and their study of the Bible and their faith in its teachings of the world and God propelled their research and ideas, and since Darwin, there have still been many Christian scientists who have offered much in scientific theory, philosophy, and discovery, such as Charles Townes, who invented lasers and won the Nobel Prize in Physics in 1964. A simple search on-line will reveal large lists of reputable, accomplished scientists who hold position in academia. Science and Christianity are only at odds, if certain scientists claim that God has no place in Science whatsoever. Option 2 – Science Depends on God Answer – It might appear as though God and Science clash, and that Christianity and Science are irreconcilable due to theories of Evolution, but in fact, Science depends on God to even function. Science emerged out of a society dominated by the Christian worldview and it arose there instead of elsewhere because of specific beliefs that accompany the Christian worldview, namely that God created the world to be good and orderly and that he preserves his creation in such a way that there is uniformity and consistency across all the universe. These beliefs are essential to the Scientific Enterprise that depends on the ability to repeat tests in the exact same manner again and again. This can only happen if we can trust that the laws of nature are the same today as they were yesterday and that they’ll be the same tomorrow and forever, not just where we are at where we are conducting the test, but anywhere in the universe. Other worldviews didn’t provide the basis for believing there are consistent, unchanging laws of nature. Option 3 – Naturalism Provides no Basis for Science Answer – If there is no God and nothing supernatural resides in the universe; all that exists would have to be natural, purely physical material. This naturalistic model of the world reduces all things to constantly progressing, shifting, evolving matter. There is no purpose or design behind the universe or our lives, and any indication towards this is solely coincidental. Such a worldview cannot provide any basis for the uniform laws of nature that are necessary for the Scientific Method of repeatable testability. If our sensory organs are the product of chance, can their relayed observations and data be trusted? Such a worldview provides no reason to explore and pursue a deeper understanding of the world; we already know that the cosmos is purposeless and in constant flux; we’re here today and gone tomorrow; what is now will no longer be; we might as well eat, drink, and be merry; enjoy our material possessions and freedom, drinking deep of the well of hedonism for as long as we have the means to do so. Naturalism must borrow from Christian theology to obtain the required presuppositions necessary to practice Science. 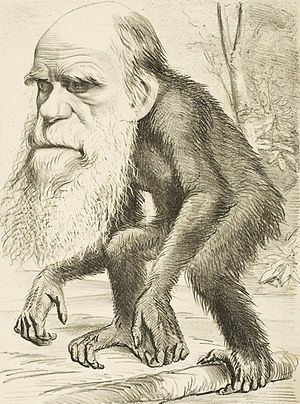 Option 4 – Show Me Answer –Darwin’s theory, although labeled, “The Origin of Species,” is used to provide a model for the “Origin of Life,” and even the “Origin of the Universe.” Such hypothetical models can never be proven via Science, since none of them can be submitted to the necessary modes of testing required under the Scientific Method to verify a hypothesis. We have to admit that we can observe evolution today, people are gradually getting taller and stronger, just look at the rise of concussions in American Football! I can see that people who have ancestry closer to the equator are darker skinned, and that people with ancestry from Asia have dark hair and dark eyes. Such visible signs today support evolution within the human race, but there is no evidence that we are evolving into something more than human, such as the mutants of Marvel’s X-Men or mutants with telekinetic abilities as displayed in the Bruce Willis movie, Looper. As of yet, such degrees of evolution, one species changing into a new, different species, isn’t observable except in the realm of Science-Fiction. Other problems also emerge with the model of Darwinian Evolution and Science. Has it ever once been observed that organic material can come from non-organic material? In other words, can life come from non-life? Has it ever been observed that a random pile of scrap material can explode and form a city of skyscrapers with an infrastructure of roads and utilities complete with humans, pets, birds, and insects to populate it, and function? In other words, can the Big Bang produce the world we see now? Has it ever been observed that material can come from the immaterial? In other words, can the primordial soup that exploded in the Big Bang have popped into existence from nothing? If you can show me any observable evidence to fit any of these questions, then there might be some credibility to your worldview. Since there is none, I want you to consider the Christian worldview to such answers instead as they fit with what we have observed as being possible: the universe was created by a Creator, not nothing, life came from the highest form of Life, God, not non-life, universal order, design, and laws of nature came from a divine Orderer, not mindless chaos! Option 5 – Game On Answer – If you are correct, and there is no God, that everything is the product of purposeless, mindless, random chance, that there is no objective basis for morality, that when I die I’m good and gone, and that survival of the fittest is truly what makes the world go round, then Game On – Viking Status! I’d take whatever I want and do whatever I want and the only way to stop me would be to kill me, at which point, I would no longer exist to know my past or to have a cognitive future. I’d be worm-food, nothing else, nothing more. However, I’ve believed in God and I’ve worshipped him since my earliest memories, and I like to think that he saved me at such a young age, because he knew what I would do if I had a worldview like yours. You ought to be very thankful that I have a relationship with Jesus, because if I truly believed what you confess to believe concerning Darwinian Evolution, I’d be the world’s worst nightmare. The Darwinian worldview provides no purpose for life besides survival and it offers no hope after death, besides escape from pain and suffering, at the cost of annihilation. The Bible shows that God created humanity in his image, which sets us apart from the animal kingdom. It’s the reason Scripture provides for why we are not to harm, curse, or murder our fellow humanity. Being made in his image, we had eternal life, perfection, intellectual abilities for decision moral decision making, discovery, and creativity that the rest of creation lacked. We also had relational capabilities for intimate relationship with God that the animal kingdom was missing. When Adam and Eve sinned in the Garden of Eden, the image of God was tarnished; we became sinful, subject to death, and cut-off from God. We retained aspects of the image of God however, which is evident through our creation and use of the Scientific Enterprise. It is through Jesus, that a way back to God has been established and in him that the Image of God is being restored within us. Repent comes from a Greek word that actually means to change one’s mind. Repent – turn from your evil ways and turn to Jesus for the cleansing of your sins and the renewal of your mind. Previous Post Did Jesus Die on the Cross? Thanks. To me I’m not a spring chicken. I’m 31 and to me that seems old. I think there are a lot of really great, young evangelists and apologists fighting the good fight who we’ll never know because they aren’t on social media, and also because of social media, we’ll begin to learn more and more about the 40 and under crowd that I do think is primed to share the Gospel far and wide in our technological age, if we can “man-up” in Christ and take our stand on his word despite the Spirit of this Dark Age. I have a massively small audience with about 30-50 views a day the last time I checked a couple of months ago, so I’m far from the greats you are referencing in quality and quantity, but I am humbled and encouraged by your words. I really do like using the phrase “Game On,” I heard that from my in-law-uncle and I added “Viking Status” randomly one day, and it seems to always get a laugh in person too. Try it sometime and see if it works for you. I’ll check out your blog when I have time. Peace in Christ. Yeah, I’m about to be 33 so I guess I still consider myself young. I have a tiny audience, too, and it ranges from people that think like me to people who aren’t saved at all. I’m just glad there are more people out there who are not afraid to put out the truth, and I thought some encouragement was in order. Blessings to you! I was just browsing your blog, and this post caught my eye. I am sorry to bring it up again, and I promise, this will be the last time, but I do get concerned because you are in a position where you are teaching hundreds of kids every year, and teaching these ideas that contradict everything that we know about the universe is really doing them a disservice. I would encourage you to take a deeper look at science, because it really is fascinating. You certainly do not have to give up your faith in Christianity to accept science, and, if that is all that keeps you from going “Viking Status”, please do not. Either way, I really enjoyed your class this year. Have a great summer. I believe one of the biggest issues with Science vs. Scripture is our “scientific” dating methods. Secular scientists carbon date assuming that the rate of decay of carbon has been the same since the beginning and that nothing has altered that rate of decay to accelerate it or slow it down. The same can be said of any other form of isotope dating or any other observations we attempt to make without the ability to accurately gauge and test those observations. We have to be certain that we are not being deceived by an illusion that we have created within our own minds by deviating from the Scientific Method. One of the biggest complaints regarding scripture vs. science was the misconception that scripture implied that the Sun orbited the Earth, citing Psalm 19:6 indicating that the sun had a “circuit from one end of heaven to the other”. We now know that the Sun does indeed have a circuit as it and the planets in our solar system have a galactic orbit around the center of the Milky Way as does every other star in the galaxy. I used to subscribe to the above and countless other misconceptions concerning scripture. Those misconceptions left me greatly misguided on what I believed (or rather did not believe) concerning the existence of G-d and the authoritative nature of scripture.